Beefalo is a species cross between Bison (buffalo) and domestic cattle of any breed. The purpose of the species cross was to blend the outstanding qualities of the Bison with outstanding qualities of the bovine breeds of the world. Many individuals have tried to cross the Bison and bovine but it was not until the 1960s that a major breakthrough took place. The cross between the Bison and the domestic and exotic beef breeds resulted in the best of both species coming together to produce a superior animal. The cross between the Bison and beef breeds combined the superior hardiness, foraging ability, calving ease, and meat quality of the Bison with the fertility, milking ability, and ease of handling from the bovine. The cross has also given increased meaning to the term of hybrid vigor. Beefalo animals can be more efficient, which can cut input costs and improve profits. 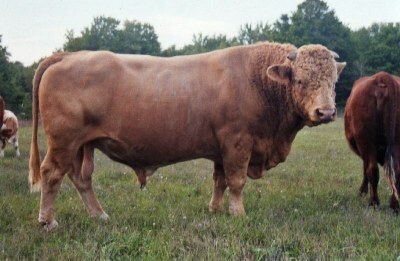 The basis of the Beefalo program is the fullblood, an animal which is exactly 3/8 Bison and 5/8 bovine. There is no stipulation on the breed used to make up the 5/8 bovine, but any of the beef breeds is generally used.